Queensland’s AFL teams, the Brisbane Lions and the Gold Coast SUNS, are proving predictors wrong this season as both teams have made their way inside the top eight for the first time in history. The result following Round 4, with both teams sitting with a 3-1 record, comes as a nice change to the form over the past four seasons. In each of the previous four years, both the Lions and SUNS have fallen inside the bottom four at the end of the home and away season. 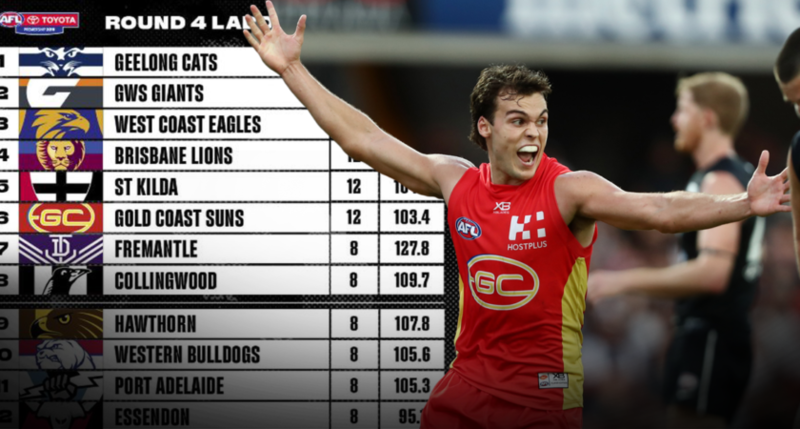 But with the tides chances, the Lions now sit in fourth place while the SUNS have climbed their way to sixth place. The SUNS kept fans on their toes right up until the final minute as Jack Bowes kicked the match-winning goal with a mere 13 seconds to go, ending the game with a narrow two-point lead against Carlton. Touk Miller was instrumental for the SUNS, registering a team-record of nine tackles in the first quarter. He didn’t stop either, finishing with a match-high 31 disposals and 14 tackles. SUNS co-captain David Swallow also led from the front with 30 disposals while up forward, Nick Holman scored two important second half goals. Gold Coast have become the competition’s close game finisher this season with all matches being won by less than a goal. The Lions weren’t able to come away with the win against Essendon on Saturday, leaving no sides left undefeated in this year’s AFL season. Brownlow Medal fancy Lachie Neale was again indispensable to the team, racking up 40 disposals, yet his impact wasn’t enough to bring the Lions over the lines as they went down 9.11 (65) to 17.10 (112). Brisbane Lions head coach, Chris Fagan, says his team missed critical set shots in a frustrating loss. “We’ve had some good works and we’ve had some bad works, but accuracy in front of goal this year really hurt us,” Fagan said post-match. The Lions are set to play Collingwood this Thursday at the Gabba, as the SUNS will be looking for their fourth victory when they take on take on Adelaide away this Sunday.